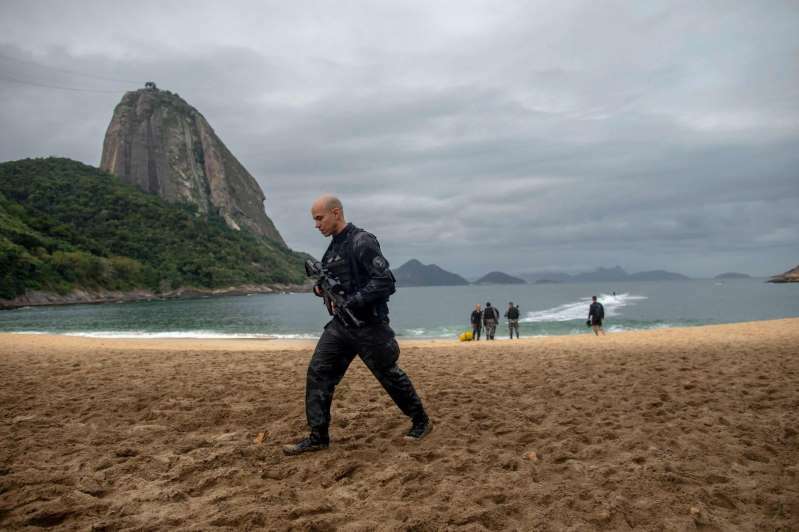 © Mauro Pimentel/Agence France-Presse/Getty Images A member of the military police patrolled a beach in Rio de Janeiro in June. By Samantha Pearson, Luciana Magalhaes, The Wall Street Journal. Wealthy Brazilians are fleeing the country, terrified by spiraling gun violence and pessimistic about the nation’s political and economic future. Thiago Lacerda, a top soap opera star, is one of scores of celebrities, bankers and other wealthy Brazilians considering emigration as a last resort. “I’m totally freaked out by what’s been happening, especially here in Rio,” Mr. Lacerda said. Unlike Central Americans fleeing to the U.S. because of gang violence or in search of work, these Brazilians are often members of the country’s elite—“precisely the people who are in a better position to help change Brazil,” said Naercio Menezes Filho, director of the center for public policy at Insper, a São Paulo business school. [post_ads]About 52% of the richest Brazilians—those with a monthly household income of more than $2,500—want to emigrate, while 56% of college-educated Brazilians want to leave, according to a study published in June by Brazilian polling agency Datafolha. Overall, 43% of Brazilians would emigrate if they could. Brazil’s government has struggled to keep track of how many of its citizens live abroad, but a series of recent studies paint a dismal picture. With the October presidential elections approaching, 41% more Brazilians have registered to vote from abroad than in 2014, according to government figures. Meanwhile, the number of Brazilians filing emigration notifications with the federal tax office reached 21,700 last year, nearly three times the number in 2011, when authorities began recording the data. Many are moving to exclusive enclaves on the Portuguese Riviera and to U.S. cities such as Orlando and Miami. Violence is a top concern, especially in Rio, where the near-bankrupt state government is struggling to provide the police with basic equipment. Even in luxury gated communities, surrounded by bodyguards, or in bulletproof sports cars, the rich say they no longer feel safe. Stray bullets from shootouts between drug gangs and security forces have caused scores of casualties, including a baby who was hit while in his mother’s arms in March inside one of the city’s well-known private schools. In the affluent Urca neighborhood, where locals go to watch the sunset, six dead bodies recently washed up on the rocks. Marcelo Caio Corrêa de Melo, a 37-year-old e-commerce manager in the city, said security is the main reason he is emigrating to Portugal at the end of this month with his wife and two children. “At the beginning of this year, I was in the office and suddenly we heard a huge explosion outside, and everyone jumped up,” he said. “It was a grenade let off by criminals running from the police.” A couple of months later, he said his father was held up by gunmen. Brazil’s dismal economic and political prospects also weigh heavily on the young. The economy is set to grow 1.5% this year, while unemployment is over 12%. About 62% of 16- to 24-year-olds would emigrate if they could, according to Datafolha. The young have to pay Brazil’s high taxes but benefit little from government spending, a huge chunk of which goes to pensions, said Tony Volpon, chief economist at UBS in Brazil. For those with a good education, leaving “looks like a good decision,” he said. The U.S. is still home to the largest share of Brazilian expats—more than a third of the three million Brazilians estimated to be living abroad, according to Brazil’s foreign ministry. “Things just work there. Infrastructure is better, and everything is not so expensive,” said Vinícius Barbosa da Silva, 20, a student from the south of Brazil who said he plans to move to the U.S. in a few years. But Portugal, the colonial motherland, is fast becoming Brazilians’ so-called Plan B. There are now 85,000 Brazilians living in Portugal, the largest community of foreign nationals, including many retirees lured by tax incentives, Portugal’s immigration and border service said. Brazilians of Japanese descent often return to the land of their forefathers. The U.K. is another popular choice, as is Switzerland—the adopted home of Brazil’s richest man, Jorge Paulo Lemann, who relocated there in 1999 after gunmen tried to kidnap his children on the way to school in São Paulo. As Brazilians have rushed to leave, the number of immigrants in the Brazilian workforce fell for the first time in a decade in 2016. Joseph Williams, a U.S. businessman who moved to Brazil eight years ago, said Brazilians can’t understand why he is still here. “I tell everyone who comes to Brazil that if someone comes at you with a gun, you give them what you have,” he said. Only this week in São Paulo, where he runs a real-estate advisory and investment firm, two men robbed the drivers in the car next to his at the traffic lights. “I threw my phone and my bag on the floor and slid down on the seat,” he said. Still, for Mr. Melo, the e-commerce manager, life in Portugal has more appeal. He is looking forward to simple things, like being able to answer his cellphone in the street—something he said he no longer does in Rio for fear of it being stolen.